(1961) Cameron Mitchell, Dominique Wilms, Rik Battaglia, Ivo Payer. 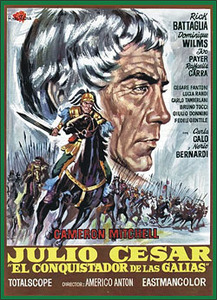 Colorful tale of the legendary ruler of Rome as he leads his legions to battle. He and his men are pitted against the vicious rebel hordes from Gaul. Lots of pitched battle scenes to keep you on the edge of your seat. Mitchell was made for these kinds of movies. This is solid sword & sandal thriller that some critics have been unfair to—it’s really a pretty good film. WIDESCREEN with BEAUTIFUL COLOR. From 35mm.